Our 2nd annual Lughnasa Celebrations are taking place on 27th and 28th July this year. Since ancient times people travelled up Brí Léith (Ardagh Mountain) to collect bilberries for the Lughnasa feast, bilberries from Brí Léith even made their way to the High King's feast at Tara each year. With the help of local eco gardener Brendan Farrell we reintroduced the tradition last July and hope to build on the success this year. 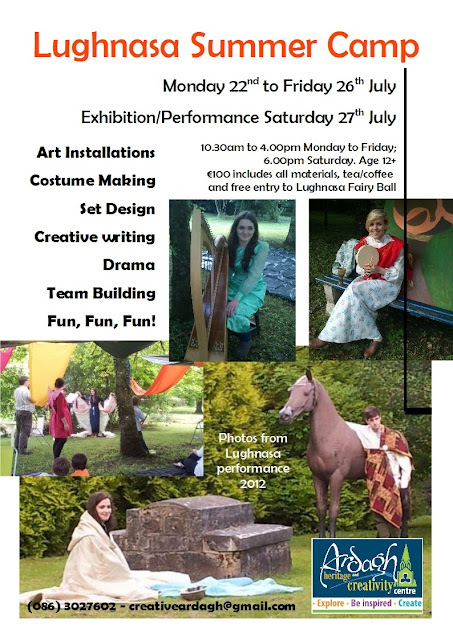 The Lughnasa celebrations will start with a summer camp for those aged 12+ from Monday 22nd to Friday 26th July from 10.30 am to 4.00 pm each day (€100 per person). During this week the participants will use their creative writing and drama skills to write and direct a play which they will perform on Saturday 27th at 7.00pm. 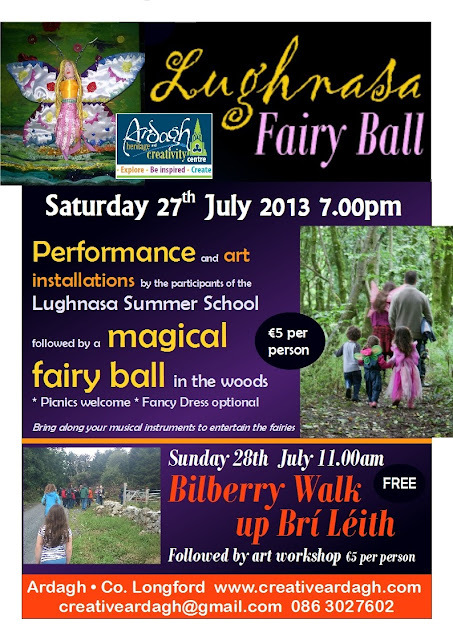 They will also be busy creating art installations around the grounds of Ardagh Heritage and Creativity Centre and the Neighbourhood Park which will be on view for all revellers at the family friendly Fairy Ball in the woods after the performance. Picnics and fancy dress are welcome, and feel free to bring along any instuments, drums, shakers etc. you have to entertain the fairies. Tickets to the performance and magical fairy ball cost €5 per person, under 2s are free. On Sunday morning, 28th July we will meet at 11.00am at Keenan Park GAA pitch for the Bilberry Walk. Afterwards we are honoured to have Mrs Annie Byrne reading some of her beautiful pieces on Brí Léith in the Midir & Etain cafe, followed by a mythology inspired art workshop in Creative Ardagh (€5 per person). Call (086) 3027602 or email creativeardagh@gmail.com for more details or bookings.